A mug of piping hot chocolate is one of winter’s greatest pleasures! Although many people use the term “hot cocoa” interchangeably with “hot chocolate,” there’s a big difference between the two. Hot chocolate, or “drinking chocolate,” is made from ground chocolate (that contains cocoa butter), which is mixed with hot milk or cream. The result is a rich, thick beverage that tends to be less sweet than hot cocoa, but more decadent. Hot cocoa, on the other hand, is usually made from cocoa powder, sugar, and milk. Because of that, hot cocoa tends to be sweet and light in body. It may even contain flavoring like vanilla or even spices like ground cinnamon. So those packets of Swiss Miss and Nestle you grew up drinking after a day of sledding are most definitely hot cocoa, and not hot chocolate. But hey, that doesn’t mean those mugs of chocolate weren’t tasty! And if you are looking for tasty and funky, then look no further than The Poky Dot. The Poky Dot offers a modern twist to old favorites. If you are more of a do-it-yourselfer, below you will find some basic recipes. And we also have some suggestions on how to turn these into more “adult” beverages. Put the cream, milk and sugar into a small saucepan and heat to a simmer. Add the chocolate and heat until melted, stirring constantly. Add the vanilla extract and heat for an additional few seconds. Ladle the hot chocolate into a mug and garnish if desired. Place the cocoa powder and sugar into a mug and mix well. Add the cream and stir into a smooth paste. Add the boiling water and stir until the mixture is smooth and well blended. Ladle the hot cocoa into a mug and garnish if desired. If you want to skip the made-from-scratch version, try Ghirardelli Double Chocolate Hot Cocoa Mix or Bellagio French Vanilla Hot Cocoa Mix. You can find both at Rider Pharmacy Gifts & Collectibles. Or try Joe ‘n Throw‘s newest beverage concoction, Moonstruck Cocoa. Now for the adult version of these basic recipes. Optional: Pinch of fleur de sel (finishing salt to flavor and garnish food) or other sea salt for garnish. In each of two mugs, mix 2 teaspoons of the sugar and 2 teaspoons of the cocoa until well-blended and lump free. Add 2 teaspoons of the cream to each and stir until thoroughly combined into a light paste. Add 3/4 cup of the coffee to each and stir again until thoroughly mixed. Top each with a dollop of whipped cream. Roll the dollop over to stain it with the coffee, then sprinkle a few grains of sea salt atop the whipped cream. Looking to add even more warming power to your hot chocolate? We love nibbling dark chocolate alongside a glass of red wine; the two flavors combined in a mug of hot chocolate is an unexpected treat. Heston Farm’s Dog and Pony added to a mug of hot chocolate is delicious! Bring chocolate and wine to a simmer in a 1-qt. saucepan over low heat; cook, whisking, until melted, about 3 minutes. Add 2⁄3 cup water, milk, and salt; bring to a boil, and cook, while whisking 3 minutes more. Pour into 2 mugs and serve with sugar on the side, if you like. You might also consider combining your hot chocolate with Mountain Dragon Mazery‘s Black Cherry Red. Chocolate covered cherries, anyone? Consider adding a splash (or two) of Heston Farm’s Captain Mick. Its spiced rum flavor with a hint of vanilla makes the perfect accompaniment. If you’re feeling really spunky, the Rise ’n Shine would be good. It’s a hot pepper moonshine and would make it more like a Mexican hot chocolate. 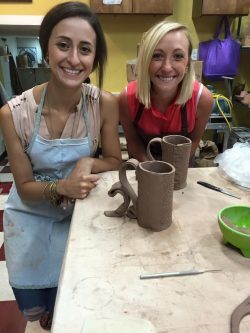 No matter how you enjoy this chocolaty beverage, it will taste even better in a handmade mug from West Fork Pottery. Handmade by you or Michael Ray! What’s your favorite way to enjoy chocolate?